Obituary for Mrs. Alberta (Holsinger) Malone | Hinchliff-Pearson-West, Inc.
Mrs. Alberta Malone, 101 formerly of Abingdon and Cameron, passed away at 6:10 a.m. Thursday, November 29, 2018, at the Knox County Nursing Home in Knoxville. 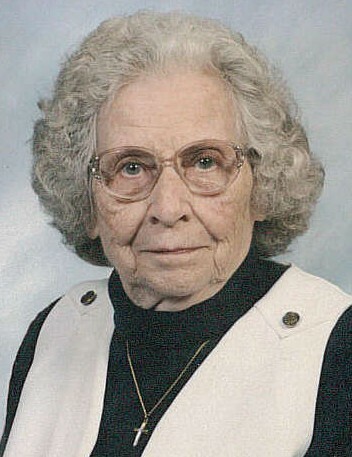 She was born on March 16, 1917 near Delong, the daughter of Henry and Amy (Leu) Holsinger. She married Willard Malone on August 30, 1941 in Hannibal, Missouri. He preceded her in death on January 30, 2007. She was also preceded in death by her parents, her sons-in-law, Peter Potenziani and Robert Rosenberry, one grandson Bradley Ritchey, three brothers and four sisters. Alberta is survived by three daughters, Eugenia “Jeanie” Griese of Abingdon, Pat Potenziani of Azle, Texas and Betty Rosenberry of Abingdon; four grandchildren, Teresa (and Tom) Irons, Barbie (and Phillip) Day, Brian Ritchey and Pam Potenziani; five great grandchildren, Daniel Irons, Jessica Irons, Katie Day, Alex Day and Brady Potenziani. She graduated from Gilson High School and attended Western Illinois State Teachers College in Macomb. She taught schools in rural Knox County, worked at the Galesburg State Research Hospital and St. Mary’s Hospital and then worked at the Cameron Post Office for many years. Prior to becoming a resident at the Knox County Nursing Home, she lived in Abingdon since 1987 and before that she had lived in Cameron for over thirty years. She was a member of the Abingdon Christian Church and a past member of the Cameron Christian Church. She enjoyed spending time with her family and friends. Funeral service will be held at 1:30 p.m. Saturday, December 8, 2018 at the Hinchliff-Pearson-West Funeral Directors and Cremation Services Abingdon Chapel. Pastor Bob Malone will officiate. Burial will follow in Oak Lawn Memorial Gardens in Galesburg. Visitation will be from 12:30 p.m. to 1:30 p.m. Saturday at the chapel. Memorials may be made to Abingdon Christian Church, Cameron Christian Church or a charity of the donor’s choice. Online condolences may be made at www.h-p-w.com.